The year 2014 was heartbreaking. Due to the Sewol ferry disaster, all the victims’ families and Koreans fell into deep grief. Neighbors marginalized from welfare service lived lonely. Children fighting against diseases had to spend colder days. Pain caused by disasters and accidents didn’t stop all around the world. To those who are lonely and feel cold physically and mentally, what is the most needed is laughter. Just as a child smiles when he is nestled in his mother, love and care bring forth happiness and laughter. Through hopeful songs, the Intl. WeLoveU Foundation gave laughter to families marginalized from welfare service, multicultural families, children with rare diseases, and residents in Sunsari, Nepal, who suffered from flood due to repeated collapse of the bridge. 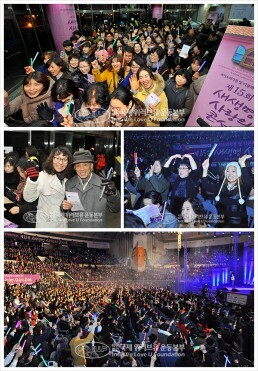 The 15th New Life Concert was held at the Seoul Student Gymnasium on December 1, 2014. Chairwoman Zahng Gil-jah, Sponsor Chairman Lee Sun-jae, President of Korea Association for Prevention of Child Abuse and Neglect Lee Bae-keun, important figures from all walks of life including persons related to foreign embassies in Korea, over 6,000 members of the Foundation, and citizens gathered at the event site to deliver hope and laughter to our neighbors who were having hard times. Lee Sun-jae, Sponsor Chairman of the Foundation, also expressed his sorrow over the Sewol ferry disaster. He gave thanks to the Foundation members, who shared their grief and gave love through volunteer services at the accident site. The sponsor chairman wished them to round off 2014 and have a happy new year of 2015. Congratulatory addresses continued. Mr. Carlos Victor Boun-gou, Ambassador from the Embassy of Gabon in Korea, mentioned the agreement of mutual cooperation in coping with climate change, which was conducted between the Foundation and Gabonese Government in 2012. He asked for more help from the Foundation that expands the range of their volunteer services globally beyond Korea so that more people could lead a happy life. Mr. Zahidul Islam Bhuiyan, the first secretary from the Embassy of Bangladesh in Korea, expressed his gratitude to the Intl. WeLoveU Foundation for helping disaster-stricken area in Bangladesh in the previous year. He wished the concert a great success as it was held for a noble purpose of helping neighbors. Mr. Harry A.C. van Woerden, Industrial Counselor and Head of Netherlands Foreign Investment Agency Korea, delivered a congratulatory address in Korean. He said, “Let’s smile. Let’s make a happy world together,” and received an enthusiastic response from the audience. At the donation ceremony, the Foundation gave Nepal a POP to construct the bridge on the Tengra River. The Foundation also gave living and medical expenses to 34 underprivileged households in Seoul and 17 multicultural families. 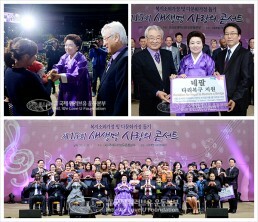 Chairwoman Zahng Gil-jah and Sponsor Chairman Lee Sun-jae comforted them, giving the certificates of donation and gifts. Then the concert began. 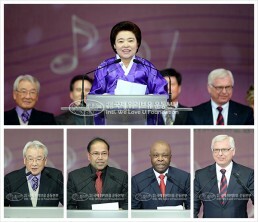 The second part of the event was presided over by Actor Kim Seong-hwan, the PR Ambassador of the Foundation. New Life Children Choir sang a medley of children’s songs. 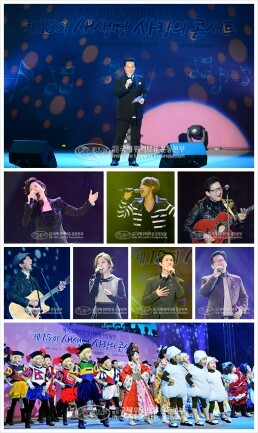 Singers Kim Jae-hun, So Chan-hwi, Yun Tae-gyu, Jeong Su-ra, Lee Seung-hun, Shin Yu, Ben, and more sang hopeful songs. “If I didn’t know how to sing, I couldn’t come to this heartwarming concert and be with you. I’m so thankful and happy to deliver love to people through my singing. Let the hard times pass away, and let’s look for happiness, sharing sadness and joy together,” said Jeong Su-ra who sang at the end. The day when the concert was held was snowy from morning, and the temperature was below zero. However, the beneficiaries and citizens were warmed up with smiles when they left for home after the concert. A child who is 17 months old is the youngest among the beneficiaries. Since birth, he got surgeries many times for his retinas and brain. He’ll soon get another surgery for enterocele. “I cried a lot for him. But from now on, I’ll smile. I hope that other people won’t lose hope and live, either,” said the child’s Mongolian mom who got married to a Korean. “Today, my family and I received a great hope. I’d like to be a wonderful person like the members of the Intl. WeLoveU Foundation who are helping others. I’ll raise my child to become generous and loving,” said a Chinese housewife who got married to a Korean 14 years ago. “Both citizens and beneficiaries shared love and enjoyed altogether, laughing joyfully. The best emotion was created among us. 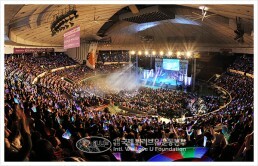 It was possible because the concert wasn’t just about physical donations but was about delivering sincere love. I wish all the beneficiaries to have a hopeful New Year with the joy that they had today,” said Ms. Shin Ja-yeong (48, from Seoul), a member who participated in the concert. Singers on the stage wiped away tears of somebody through hopeful songs, and so did the audience through hearty laughter. The Intl. WeLoveU Foundation will continue to grow flowers of laughter in the places of tears through volunteer service with a mother’s love until all mankind becomes happy. This is the dream of the Intl. WeLoveU Foundation.